Daemon Rutledge, Executive Producer of Reputation Media TV & Founder | CEO of Circle Consulting Agency LLC. My large team of marketing consultants, and I, have been helping businesses grow with a focus on sales and marketing using reputation and brand marketing strategies. I created Reputation Media TV, a division of Circle Consulting Agency LLC, to enhance our mission which is to continuously improve our clients’ ability to grow their business by building a long term relationship and implementing extremely effective solutions that will directly make a positive impact on brand marketing, reputation, and customer traffic. Reputation Media TV positions your business as the market leader in front of thousands of buyers using your reputation, and skill knowledge, in video. At Reputation Media TV we launched a brand new BETA Video Program that includes producing Brand Review Commercials and Expert Interviews for an Online TV Show. The Expert Interview videos help your business by showcasing you as “the Expert” in your Local Area. This will help better educate consumers that are searching online for your services on how to find the “Best” in your City or area with tips to look out for. The Review Commercials showcase your amazing reputation in front of the buyers that are using reviews, and reputation, to look for a service or product, like yours. While in Beta, we are covering all the production costs (a $3000+ value) and the video becomes a lifetime asset of the business to use in their own marketing efforts. We will also syndicate it to the top Social and video websites. Why are we covering all production costs? Finally, to help us build our portfolio of expose interviews, reputation commercials, and improve our processes using your feedback, before we launch live. I believe we have cracked the code with our patent pending process in making Expert Interviews and Review Commercials because we address the 4 main areas MOST businesses struggle with online marketing; SEO, Social Media, Branding, and Reputation. Separately, each area is time consuming, costly and difficult to figure out. Click the button below or enter your information to request entry into our beta program and receive a review commercial or expert interview, at no cost to you! We cover all the production costs! 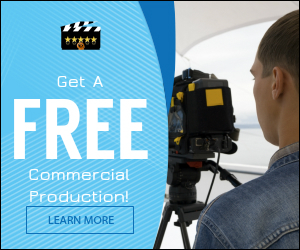 Schedule a 15 minute phone call with one of our executive producers to get more information about allowing us to produce a commercial for your business. All production costs are covered!.